KYOTO — June 15, 2006 — Sophia Cradle Incorporated (Headquarter: Kyoto; CEO: Kazunori Sugiyama), an innovative developer of mobile phone software, today announced to release data compression tool for BREW[*1], SophiaSCALE[*2] for free. Source code and SophiaSCALE for Mobile Java[*3] platform will be offered with it. By using SophiaSCALE for BREW and for Mobile Java, the same compressed data can be used in both BREW device and Mobile Java device. June 15, 2006, Sophia Cradle Incorporated has released SophiaSCALE for BREW to all their customers for free. SophiaSCALE for BREW will be offered with the Mobile Java version and with source code. It is also open for business use. 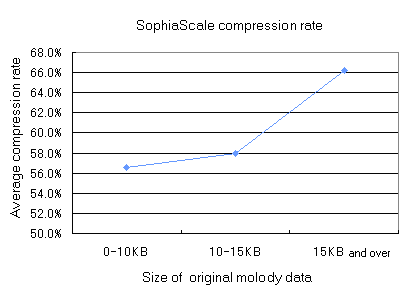 Average compression rate of SophiaSCALE is 66 %. By customizing the parameters in the source code, depending on the type of data being compressed, the compression rate can be improved. The decoding software on the device is 6 KB for BREW device and 2 KB for Mobile Java device. By using SophiaSCALE for BREW released today, and Sophia SCALE for Mobile Java which was released in 2004, the same compressed data (.sz) can be shared between two platforms. Any data compressed at the server side by SophiaSCALE can be decoded or decompressed by SophiaSCALE decoder on the client device side. SophiaSCALE is adapted to all Mobile Java platforms and all versions of BREW including version 1.x. Since BREW 1.x, which is still used world wide, does not have data compression function within it, the need for SophiaSCALE is expected to be higher abroad. SophiaSCALE is acronym for SophiaCradle Small Compressing Algorithm Library for Embedded application. It uses Hoffman Algorithm ( an algorithm that determine the frequency of certain patterns and displaces long patterns into short patterns ) as a data compression mechanism. SophiaSCALE for Mobile Java has already been adopted by on of the largest contents provider in Japan. A programming language developed by Sun Microsystems. Applications written in Java are platform-independent. In other words, the same Java program runs on all hardware platforms without modification. A mobile phone user can download and use a Java application on a Java-enabled handset. In Japan, a network operator NTT Do CoMo started Java service in January 2001 for the first time in the world, namely "i-appli." Today, mobile phone Java services are available in Europe, America, Asia and elsewhere.